It’s very hard to find a good Dual Sim phone from a reputed mobile manufacturer company. 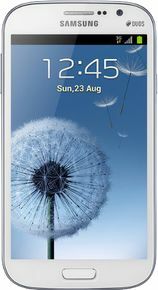 Now a days Mobile companies are taking care of every genre of people and taking the consideration of middle level Samsung launched a Dual sim Mobile phone called as Samsung Galaxy Grand Duos I9082. After launch it created a huge chaos in the market. Even we also like it at some extend but after using we came to many conclusions listed below. The Built in body is same as usual like other Samsung Smartphones. One can’t judge whether its Samsung S3 or Galaxy Grand with view at once. The finishing is not so good as expected. The Screen doesn't have gorilla glass so again you should take care when operating to prevent from scratching. It is powered by Dual Core, 1.2 GHz Processor with 1GB RAM which tells me that it will process very slow if you will install a number of applications. Samsung only make phone which don't have a battery life and the phone always hangs. It's a Dual sim phone but the main issue is that one line may be unreachable without your prior knowledge. You will get Android, v4.1.2 operating system with that and you can’t upgrade to its next level. The display is a standard TFT LCD and the color reproduction is very nice. The 8MP camera is accompanied by LED Flash. The picture quality for the outdoor shoot is good as comparable to the Indoor shoot, little noise Creepy. One can record the video to a max of 1080P. It comes with 2100mAh battery and will run around 8 hrs to 9 hrs if you are playing video. It’s good that you can watch a lot of videos for such a long time. If you are running both sim then the battery will degrade very fast. If you are looking to buy this phone then you should check for more variety like MI3, Moto G or Honor Holly. You can compare online Mobile at Smartprix India. MWC 2013 The Samsung Galaxy Grand is the phone that promises to bring the best of the Samsung Galaxy S3 and Galaxy Note 2 in a more affordable smartphone, while not skimping too much on the specs. for each action it will nearly 2-3 minutes to get response . this is really a headache product that i have ever seen. Some times it took nearly 30 minutes to book cab due to its very very bad slow reaction. Please don't buy this mobile. as of my knowledge after you install 3 to 4 apps(apart from inbuilt) it will start irritating you like anything. that too after inbuilt apps get updated, mobile becomes even slow. i am going to throw this any way. Very annyoing as I had to restart it once everyday because it goes on hanging. Huh!